Iain Banks has only a few science fiction books, most of which are set in the Culture Universe. Courtesy of the man himself, Iain Banks posted a long (yet eminently readable and funny) description of the Culture universe, which is worth reading. You can read it here. Keep in mind, however, that you don't need to know anything about the Culture before you read any of his books - it's all explained within. The covers of the Culture series are a little more stark than the cityscapes of the Foundation series covers, but generally the trend for covers is heading towards more simple and cutting designs. They aren't exactly amazing, but they catch the eye. Unlike many of the other Culture books, we see the Culture from an outsider's point of view. The Culture, by the way, are the 'good guys' - they're a pseudo-democracy ruled by hyperintelligent AIs called 'Minds.' You know, I won't even bother trying to explain the social dynamics of the Culture culture - you'd best read what Banks has to say on it himself (a link to that is at the top of the page). Banks also has a tendency, shown also in The Player of Games to concentrate on two levels. First, you have the wider picture - in the case of this book, it's the war between the aggressive Idirans, and the peaceful-yet-somehow-scary culture. In a galaxy of at least quadrillions, Banks bandies about terms such as 'Total casualties, including machines: 851.4 billion.' You get to see destructions of entire human-constructed habitats, containing billions of people. Yet the book isn't about the war. It's about people, in particular, Horza, a Changer. Horza works for the Idirans, and he has compelling reasons. He argues that in a galaxy ruled by Machines, who do not evolve and have no wants, society would stagnate. And so he chooses the lesser of two evils - it's not as if the Idirans are nice guys, but at least they're alive. That's not all. Horza's 'quest' in the novel is to discover one of the Culture's 'Minds' that performed a particularly stunning hyperspace jump, and after a series of adventures, he finds it. Add into the equation a Culture Special Circumstances Operative, Perosteck Balveda, who eventually meets up with Horza for the second time at the end of the novel, and a conclusion that is nothing short of enthralling, and you have a novel worth reading. Yet there's something missing. As with The Business, you get a feeling that Consider Phlebas isn't going anwhere. Yes, there's a main protagonist, and yes, he's looking for the special Mind, but for a large part of the novel, the Mind isn't mentioned at all. Horza just seems to be bumming around the galaxy. Sure, he does this in style, and it's good reading, but it doesn't do anything. 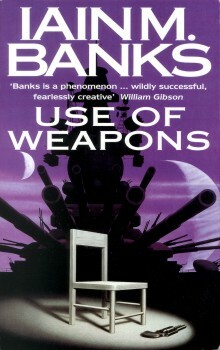 As usual, Banks concentrates on the individual in this novel, not the wider picture, as space operas do. This is not a space opera. And, as usual, Banks puts a darker, gritty feel to the galaxy of the future. This is a Good Thing. His Culture universe is one of the freshest, most invigorating ideas to hit SF for some time. 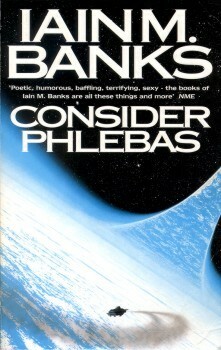 Perhaps emblematic of its failings, and its triumphs, Consider Phlebas defies summarisation. I can't begin to describe the novel. It's a book worth reading, but if you're new to Banks' Culture universe, I would recommend trying another novel first. Want to know where the book's title comes from? Check out the link in the margin of this review. Before I say anything, I have to state a simple fact. I love this book. This is possible the very best single book that I have read, ever. Thus, I am likely to be biased to such an extent that on a probability density curve, I'd be miles out of sight. That said, I think I'm justified in saying that The Player of Games epitomises the best of what Banks is, and does away with the (admittedly small) worst. Why do I say this? Let's see. This novel has a compelling and clearly defined storyline. It has direction. Furthermore, it also concentrates on the ethical and moral dimension that Banks is so wonderful at writing. Moreoever, the reader knows what Banks is talking about in this. There's very little, if any, talk of science, or weapons. This isn't really science fiction. It's just imaginative fiction. 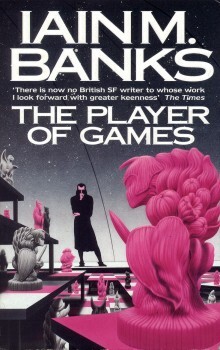 The Player of Games is probably the most 'normal' of Banks' Culture novels, in that it's only got one storyline (and even better, it's going forward in time), it's only got one main character, and the plotline is defined close to the start. So it's probably the easiest Banks book the read. What about the story, I hear you cry? At last, here's a Banks novel that can be summed up fairly easily. Jernau Morat Gurgeh is the greatest player of games in the Culture society. By games, we mean puzzles, action games, mental games, mathematical games. And after being alive for some time, he's looking for a challenge. Through a series of interesting (yet not improbable) happenings, he is sent by the Culture to the Empire of Azad, to attempt to win their Game. Azad's game is a game with such complexity and intricacy that it governs the entire Empire's social structure. People are chosen for governmental posts based on their proficiency at the game. And the Culture doesn't like the Empire, for fairly obvious reasons - the Empire is a cruel, inhumane society (not unlike ours) and the humans of the Culture wish to do something about it. After all, in the Culture, your every need is catered for, and humans need to find something that justifies their living. So they go and tell other people how to live. Gurgeh's inexorable rise through the tournament of the game gives the reader some seriously interesting reading, while at the same time it's good to note his reaction to the Empire's cruel society, after having lived his entire life in the cuddly Culture society. He has Culture-shock, if you will (come on, I had to get it in somewhere). And perhaps Banks other talent comes to the fore here. As also shown in Excession, Banks is the master of invisible storyline twists and stunning revelations. You get so caught up in this novel that you never actually wonder why things are happening the way they are. I could say more, but I'm not going to. Suffice to say that the last few chapters of the novel make you appreciate how well Banks had planned the storyline. There's still more. The Player of Games is an eminently funny book, at parts. It's 'laugh out loud' funny. The sarcastic and cutting remarks made by the two main characters, Gurgeh and his protective AI drone, Mawhrin-Skel, are only equalled by the humour in Excession. Finally, we have one of Banks' trademark writing skills. He manages to describe complete depravity and cruelty in an almost insoucient, leisurely manner. He somehow makes it look stylish, in the same way smoking used to look cool. The highly intelligent scholars of the Empire talk casually about how the instruments of their orchestra are made from people's bones and skin. And they laugh. If you're new to the Culture series of books, this book is most definitely for you. It's the most 'normal', yet simultaneously the most interesting, book, IMO, of the Culture universe. Give it a few years, and it'll get the Five Gold Stars it so richly deserves. News: You'll be interested to know that PathéGuild, the makers of The Blair Witch Project and a load of other stuff have bought the rights to The Player of Games and the movie is apparently in production as we speak. Obviously they know quality SF when they see it. My only hope is that they don't screw it up, so all of the Culture novels can become movies. According to the 'Culture' newsgroup that I subscribe to, Use of Weapons is generally accepted to be the best Culture novel out. On a second reading, I realised that perhaps they did have a point, even though I prefer The Player of Games. Use of Weapons, though, is not for the faint of heart in reading - it's got two storylines proceeding at the same time - really, three, I suppose - and it takes a little figuring out to find out what's going on. So it's definitely the least 'normal' of Culture books, although when you get down to it again, it all boils down to the relationship between the main character and people in his past. 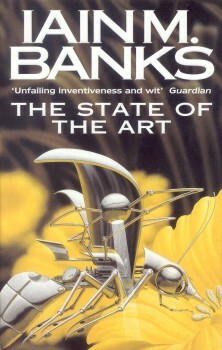 The State of the Art is a collection of short stories written by Banks, spanning only three years (1987-1989) yet containing eight stories, three of which are set in the Culture universe. I was quite looking forward to reading this collection, since I'd only read his novel-length books so far, and wanted to find out if the man would hold his cool in shorter stories. Also, I was told that Diziet Sma, a character from Use of Weapons, was in the short story The State of the Art. The collection kicks off with a rather odd, very short story called Road of Skulls. Since I only skimmed past it, I almost definitely missed the deep and profound message that was contained within. To be honest, I wasn't entirely sure what this was even about, it being only five pages long. "Fornicate the story," Mc9 said sleepily, not opening his eyes. Moving swiftly along to more comprehensible territory, A Gift from the Culture returns to our favourite SF universe. In it, we witness an ex-Citizen of the Culture being blackmailing into using a special Culture-only weapon to shoot down a military starship. Needless to say, things become a little more complicated, yet up until the end you keep on thinking that you know what he's going to do. Unfortunately, my brain is so muddled/slow that I can't grasp the link between the title of the story, and what it actually means. A thorough re-reading is in order. At this point, you're probably thinking - has Adrian even read any of this book? He doesn't seem to understand any of it. Well, aren't you lucky, because there are a few I do understand. Odd Attachment, the next up, is an altogether weird story from the perspective of a giant plant. I'm fairly sure it's not a Culture story, but I didn't find it to be particularly gripping. Warped, yes, gruesome, definitely, but not interesting. A story that no doubt some will like (but not me) is Descendant - in this story, for all of the Culture's vaunted technological superiority and contingencies, something goes horribly wrong and the protagonist starts going insane. Not amazing though. I found Cleaning Up to be a pleasantly strange and different science fiction short story, the likes of which I have to say I haven't ever read. Slightly longer than all the other stories mentioned so far, it explores what would happen if alien artefacts started mysteriously appeared across the globe, right in the middle of the Cold War. Throw in a frankly eccentric global corporation chief, a twisted world and some very strange goings on (that are at times extremely funny) and you have a great story. Probably the best short-short story in the book, I reckon. The appetiser before the main meal of the collection, Piece, cannot be called science fiction or fantasy in any sense of either words. Nevertheless, I found it pretty thought-provoking and it's got the obligatory twist in the tale at the end. I think it would have made a bit more of an impact on me if I'd been older at the time of the events described, though (which obviously means that the story is set in the 'real' world). And now we come to The State of the Art, a full 100 pages long. Essentially, it describes the musings of Diziet Sma, an agent from the Culture, about Earth in 1977 - the ship she's on, the Arbitrary, goes into orbit around Earth and starts collecting all the data it can about Earth, and sends Sma and other crewmembers to investigate. Nothing blows up, and there isn't much intrigue. Not your normal Culture novel, then. Yet it does offer some insight on what a culturally advanced Culture (har har) would think about our comparative savageness, and sometimes has some cutting remarks about the way we live. 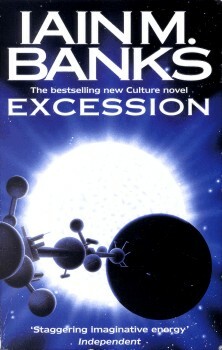 Of course, you have Banks' trademark (sometimes black) humour threading its way throughout the story, and the main narrative, apart from the debates between the ship and Sma about whether they should contact the people of Earth, is about an agent of the Culture who decides he wants to stay on Earth. Eventually, the agent meets his end in a scene that resembles the greater concern - whether the Culture should contact Earth. I think Banks is trying to say that the Culture could intervene in the affairs of Earth, and try to stop us from blowing ourselves up, but eventually it wouldn't make one bit of a difference. Also while I'd been away, the ship had sent a request on a postcard to the BBC's World Serve, asking for 'Mr David Bowie's "Space Oddity" for the good ship Arbitrary and all who sail in her.' (This from a machine that could have swamped Earth's entire electro-magnetic spectrum with whatever the hell it wanted from somewhere beyond Betelgeuse.) It didn't get the request played. The ship thought this was hilarious. Also there are the parts where a crewmember, after watching one too many Star Trek and Star Wars movies, decides that he wants to become the Captain of the ship (even though the ship is controlled by an AI that is unimaginably intelligent). Unfortunately, he seems a little mixed up when he starts democratic elections for the post. His election speech, however, is incredibly funny. Just make sure you aren't drinking anything while you're reading it. All in all, The State of the Art is an admirable story, but it might be a little too slow paced for some, and perhaps too introspective. However, the frequent injections of humour and digressions should keep you awake. The last story in the collection, Scratch (or: The Present and Future of Species HS (sic) Considered as The Contents of a Contemporary Popular Record (qv). ), is a morbid look at the self-destructive and ultimately depressing nature of humans. It's not a coherent flowing story - rather, an dozen excerpts, reading as if they were stream-of-consciousness, from adverts, conversations and diatribes. You can't help thinking Banks doesn't have much faith in the human race, especially when you read the last few words of the story. It's not a bad collection, but I'd have to admit that I didn't enjoy it anywhere near as much as any of Banks' other Culture novels. That said, it has a few gems in it. Some parts will appeal to both the SF and non-SF readers of Banks' novels; the problem is that some of it won't appeal to either.